1. City in the Shefelah, described as lying between the towns of En-gannim and Enam; probably situated north of the Wadi al-Sunṭ, and identical with the modern 'Artuf (Josh. xv. 34). 2. City in Ephraim, marking the western boundary of the tribe (Josh. xvi. 8). 3. 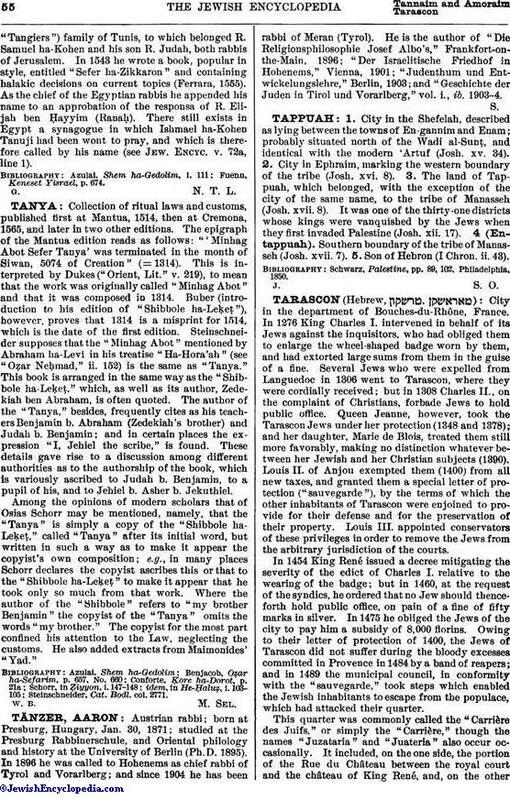 The land of Tappuah, which belonged, with the exception of the city of the same name, to the tribe of Manasseh (Josh. xvil. 8). It was one of the thirty-one districts whose kings were vanquished by the Jews when they first invaded Palestine (Josh. xii. 17). 4 (Entappuah). Southern boundary of the tribe of Manasseh (Josh. xvii. 7). 5. Son of Hebron (I Chron. ii. 43). Sebwarz, Palestine, pp. 89, 102, Philiadelphia, 1850.